As the second State in Australia, Queensland, while smaller than Western Australia, could still fit, within its borders, the entire land mass of New South Wales, Victoria, Tasmania, with New Zealand thrown in as well, and still it had land to spare. In the early 1900s ‘land seekers’ flocked to Queensland, particularly from Victoria and New Zealand, where large parcels of agricultural land were harder and harder to come by. 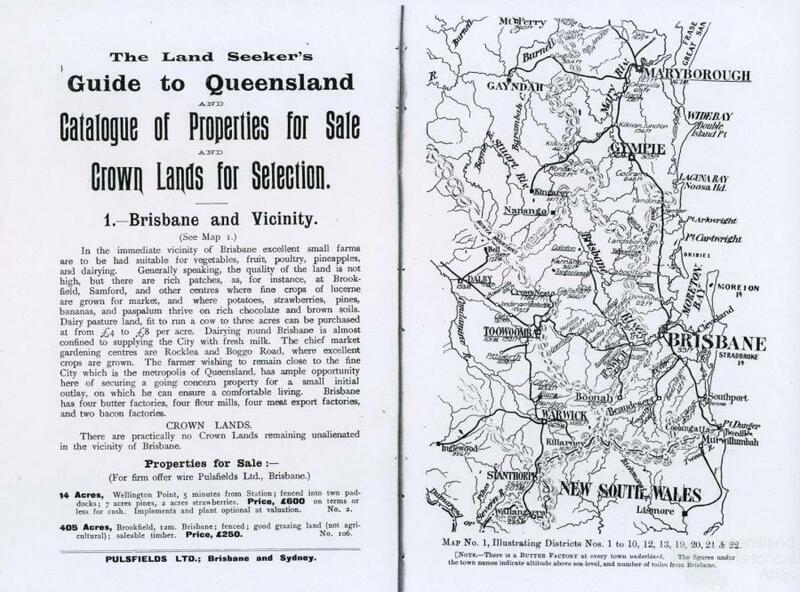 When the Brisbane firm Pulsfields published their Land seekers guide to Queensland in 1908, they pointed out that while Victoria had a population of fourteen persons per square mile, New Zealand eight, Tasmania seven and New South Wales five, Queensland had only one person per square mile. Queensland could be marketed as ‘the land of undeveloped possibilities’ where ‘young men’ could buy or select land in any part of the state. 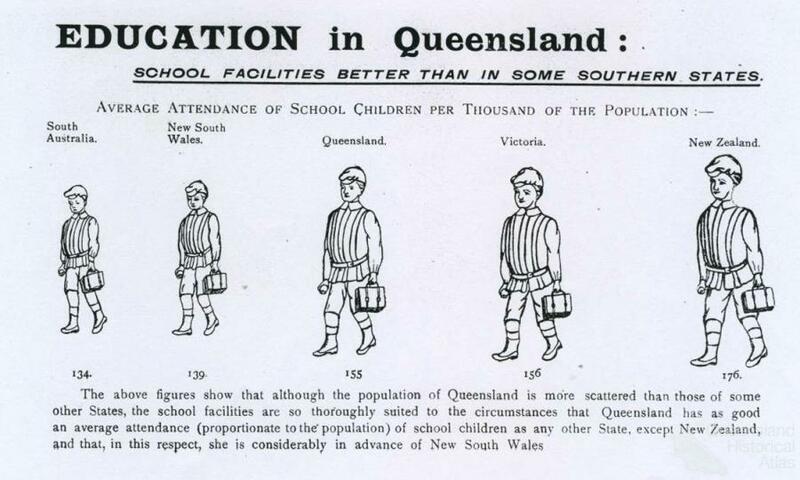 And Queensland had other attributes. It could claim the second lowest death rate in the world, and the fastest growing population by ‘natural means’ of ‘any civilized country on Earth’. Pulsfields, ‘The Queensland Land Firm’ conveniently left out of this analysis all of the non-white world, nor did they mention that the State’s 500,000 residents had a younger average age than the other Australia States, let alone the countries of Europe. 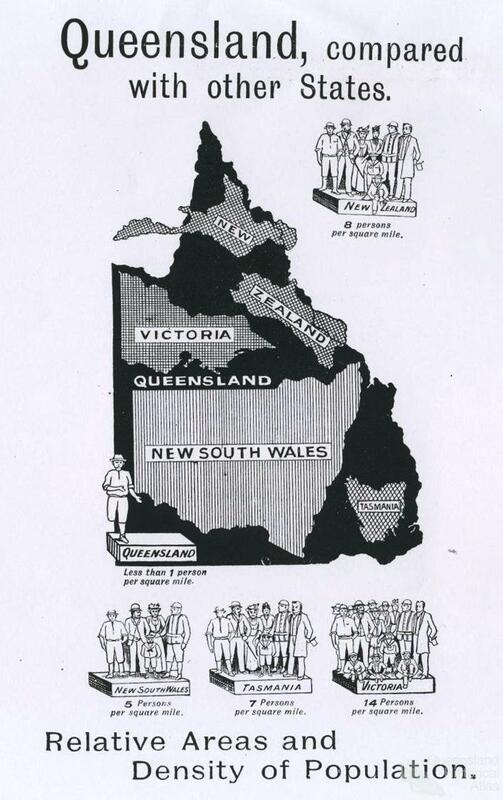 Pulsfields explained that people in the south used to say that Queensland was ‘black man’s country’. To disprove this, the company pointed out that the summer temperature in Murgon was less than Maitland in New South Wales. Queensland also offered the widest variety of agricultural land in the nation, with the best vegetable growing climate in Australia, particularly around Brisbane and the Darling Downs. ‘Conservative’ settlers could happily grow strawberries, potatoes, tobacco and other ‘old-fashioned crops’ of southern climes, but ‘enterprising men’ could go into coffee, bananas, sugar, and grazing. The Land seekers guide broke up Queensland into regions, from Brisbane to the far north of Cape York. In Brisbane itself the land quality could not be bragged about, but beyond, especially the volcanic soils of the Glasshouse Mountains and beyond were ideal for dairying, pineapples, bananas and other crops. 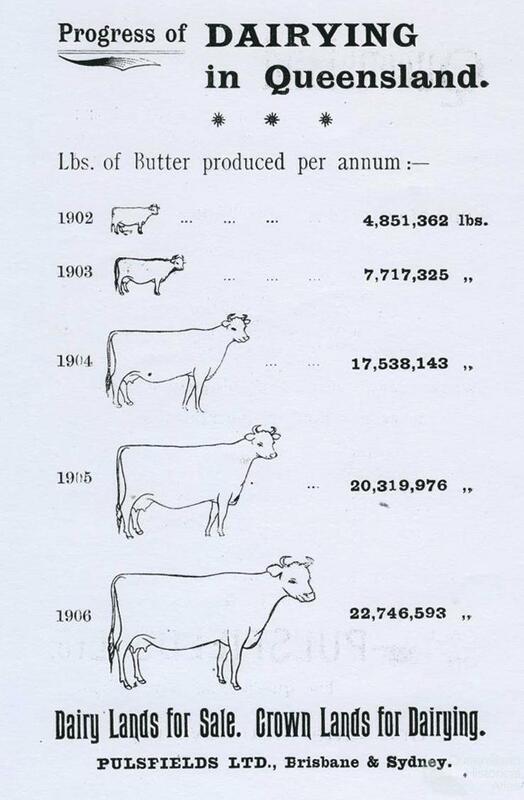 The South Coast and Beaudesert, served by the new railway line to Beenleigh and Tweed Heads, offered much land ideal for dairying, arrowroot and, on the flatter areas, sugar, with nine sugar mills in operation. The Darling Downs were described as ‘the largest tract of uniformly and highly fertile land in Australia’, with two and a half million acres of rich black and red soils. Unlike some other parts of Queensland the Downs were ‘almost free of pests’ with just a little prickly pear, ‘no ticks and no rabbits’. The Gulf Country, in the far north of the state, offered first class cattle country, where prospective farmers could take up crown land in the form of huge pastoral leases. The leases offered were up to 800 square miles. The properties on offer in the Land seekers guide catered to every agricultural interest and almost every pocket, with agricultural land near major cities starting at £1 per acre, while vast properties for cattle and sheep were well within the finances of ‘men of capital’. Artesian bore water was on offer in many parts of the state, and with the state government breaking up some of the larger estates, including Jimbour and Maryvale, prime agricultural land could also be purchased for a modest outlay. Pulsfields claimed that between 1905 and 1908 they had already attracted 600 Victorian and New Zealander farmers to Queensland, leading to a population increase of 3000. 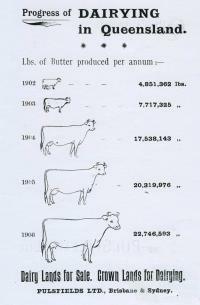 Of these, the 1500 men were ‘the best kind of population – primary producers’.